A private complementary health clinic offering gentle, effective and affordable treatment for the whole body. 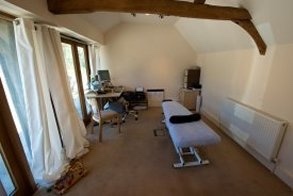 Owned and run by Fiona Dowdell, an experienced McTimoney Chiropractor, assisted by her Chiropractor colleague Annette Regan and offering two highly qualified and talented massage therapists, Fiona Reese and Phil Nuttridge, the clinic specializes in musculo-skeletal health. In a peaceful rural setting with off road parking it remains convenient for the major towns of Aylesbury, Buckingham, Milton Keynes and Leighton Buzzard. In addition to treatment our therapists can all offer exercise, lifestyle and posture advice to help with an optimum return to and maintenance of fitness. A spinal mobiliser bench is available for in between treatment top up care.